Summer is here! Well, for us, summer has been ongoing for the last seven months. As the heat rises there is one food that I find essential. I find all sorts of excuses to eat it because it is my most favorite meal in the world, but this dish is particularly refreshing and perfect for a hot summer day. 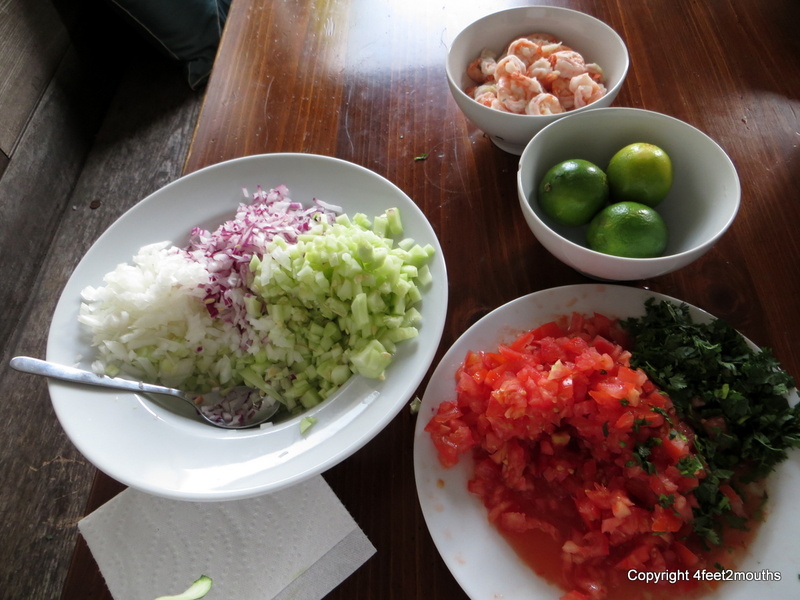 My favorite food is coctel de camarón, a Mexican shrimp cocktail packed with vegetables and shrimp and a cold broth that I can eat by the gallons at all hours of the day. This dish is perfect because it pulls together all of the wonderful qualities of every great meal. 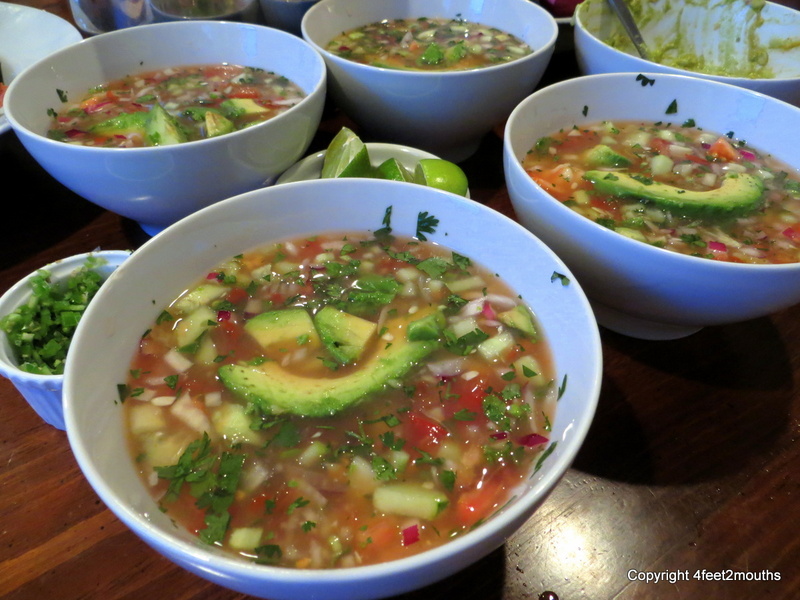 The shrimp broth provides an underlying savory and salty flavor that is made sour and fresh with lime juice. 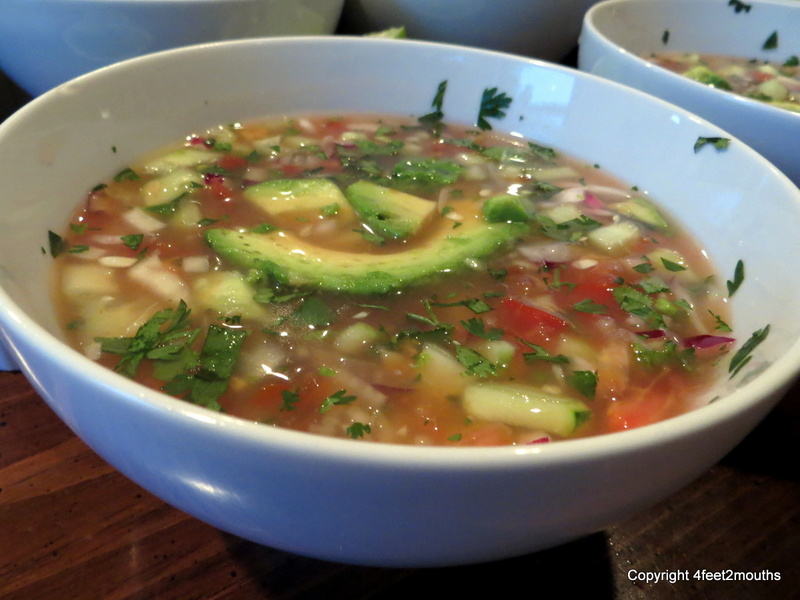 Jalapeños provide a spicy kick and the ketchup a touch of sweetness and a pink color to the broth. Together these flavors combine with a trilogy of textures with crunchy vegetables, creamy avocado and crisp tostadas. Simply put, it is perfection for the mouth. My love for this dish began in April of 1992. My family traveled to Durango, Mexico to visit my stepdad’s family. It was so hot there that I remember much of the daytime was spent alternating between tamarindo paletas (tamarind popsicles) and shrimp cocktail. We would find pushcart vendors on the street and the four of us would enjoy huge, cold goblets full of the stuff to escape the roasting sun. Most recently I was inspired to prepare this dish for friends on a stiflingly hot day in New York. Taylor and Andrew let us use their Brooklyn apartment for a shrimp cocktail feast. We supplemented the cocktail with my much loved guacamole, aguachile shrimp ceviche and an epic game of Settlers of Catan for a fun evening. Good luck Andrew when you make this for your family in Australia this week! I should note that there are many ways to enjoy coctel de camarón. My little brother bites into heaping mounds that are precariously laid on the crackers. My eldest brother and sister-in-law add extra hot sauce and spoonfuls of additional peppers, my step-dad more salt and my mom several extra limes. Whatever the style, we ultimately all sit laughing together and enjoying our favorite meal. Some families have a roast around the holidays, but every Christmas Eve you will find me consuming bowls and bowls of this delicious soup. There are restaurants that make it, but they shortcut and it will never turn out as good as I am going to share with you. I love this stuff. Share it with family, friends or hoard it all to yourself. This dish is something to be enjoyed, savored and prized. ¡Buen provecho! 1) Six hours ahead. Boil 3 quarts salted water in a large pot. Meanwhile, de-shell, remove tails and devein all the shrimp. Rinse and set aside. Quarter an onion and toss into the pot ¼ and the skins and the ends that usually end up in the compost. Add the smashed garlic and boil for five minutes. Grab a stopwatch and a spider strainer and drop in the shrimp. At 60 seconds taste a shrimp by biting it in half and looking at it. Pull them out at roughly 75 seconds or 85% cooked. The shrimp will continue to cook in the bowl, add a few ice cubes and stir. 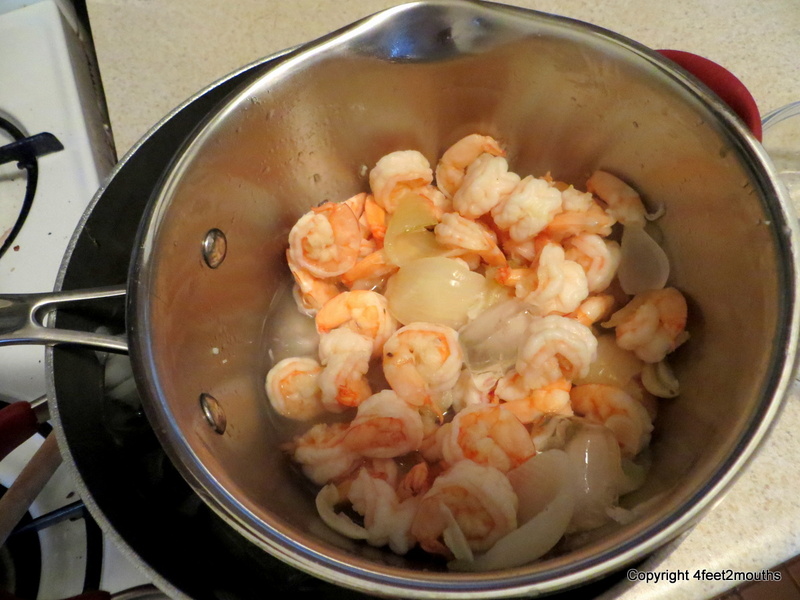 Remove the boiled onion, skins and garlic from shrimp and discard; pour liquid into broth pot. Wrap shrimp bowl in plastic and store in refrigerator. Top the pot with the shrimp broth and move into refrigerator. If you are pushed on time, the broth may be cooled in the freezer over a couple hours or placed in the sink with cold water and a few pounds of ice. Notes on shrimp: Gauge the boiling time based on size of shrimp, jumbo shrimp may need to be sliced lengthwise to equalize cooking time. The rubberiness of overcooked shrimp really comes out in the fresh soup, don’t do it. Boiled shrimp with onions and garlic, strain and cool rapidly. 2) One hour ahead. Chop vegetables and add to a large bowl. Halve and squeeze at least 6 limes into a small bowl. If you are using the little key limes plan on 12. Use more if you have dry limes. Remove pot of cooled broth from the refrigerator and place set 2 cups of the broth aside (this is in case you mess up). 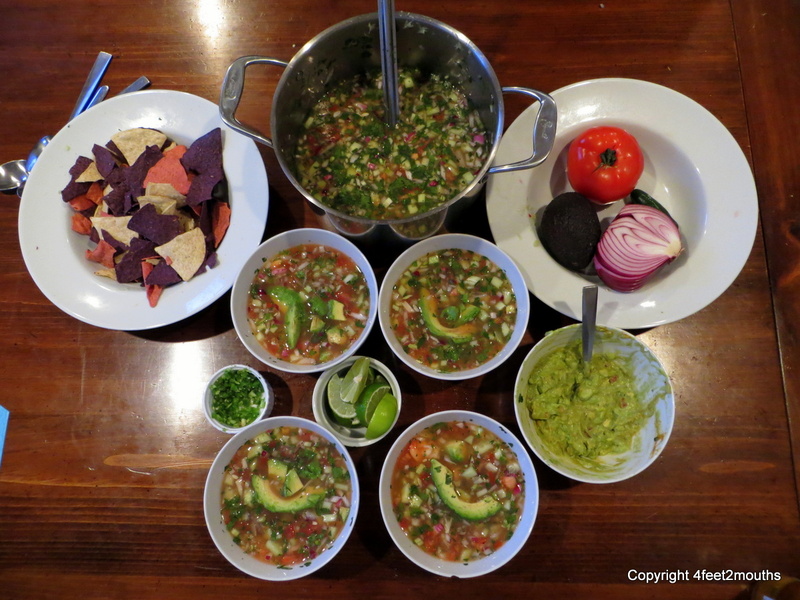 Toss in all the vegetables, some of the jalapeños, ¾ of the lime juice and a few tablespoons of ketchup. Stir to combine with a ladle. Look at color and taste. Now is the time for iteration; we have three flavors to work with: salty, sweet and sour. The broth is going to taste a little bland at first, but gradually the favors start to come together. The iteration is necessary because we do not want to over-salt, over-sweeten or over-lime the cocktail. Add more salt and the flavors of the broth with start to become more prominent. 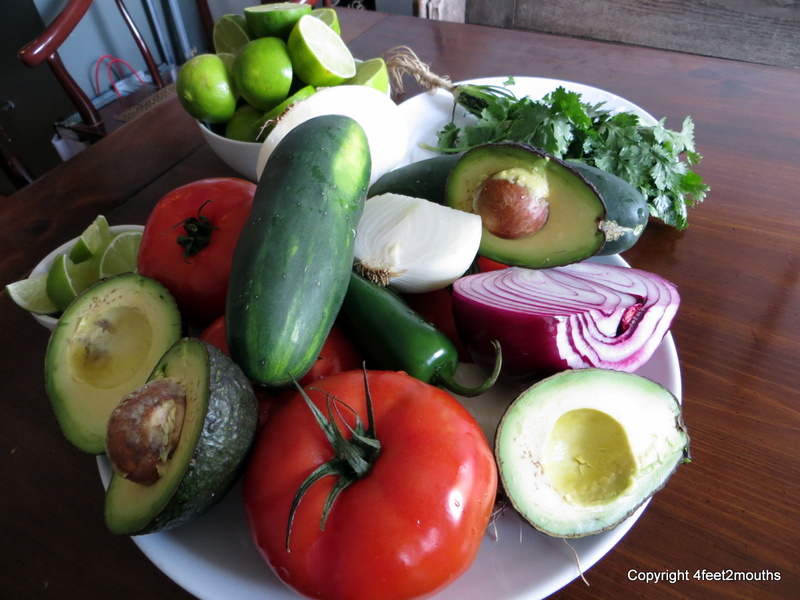 Squeeze another half a lime or two and taste again as we bring out the brightness of the fresh vegetables. The ketchup will bring about a nice balance to the broth, but if too much is added then it is difficult to fix. Repeat the iteration, tasting and observing the color. The addition of ketchup will transform the broth from murky translucency to a light pink (see picture). Red broth means you have too much ketchup, add the reserve broth and re-iterate. The lime, unfortunately takes a few minutes to meld with all the flavors, if you think you have too much lime, wait ten minutes and try again. Add more jalapeños to give it some kick. When the broth has flavors that make your mouth want to explode, then it’s almost ready. Return it to the fridge to let the flavors mingle for 20-30 minutes. 3) Fifteen minutes ahead. Assemble the garnish of jalapeño, avocado, limes, crackers and tostada shells on a plate accessible to everyone. Squeeze lime over the avocado to keep it from browning. Remove the cocktail from the fridge and taste again. Add another lime and maybe some salt. Taste again and doctor to perfection. 4) Serve in large glass goblets if you have them. Place a few slices of avocado on the top. Squeeze a fresh lime wedge and eat. From this point consumption becomes the style of the hungry eater, and in my house there always seems to be plenty. 5) The day after. You will likely end up with too much broth. 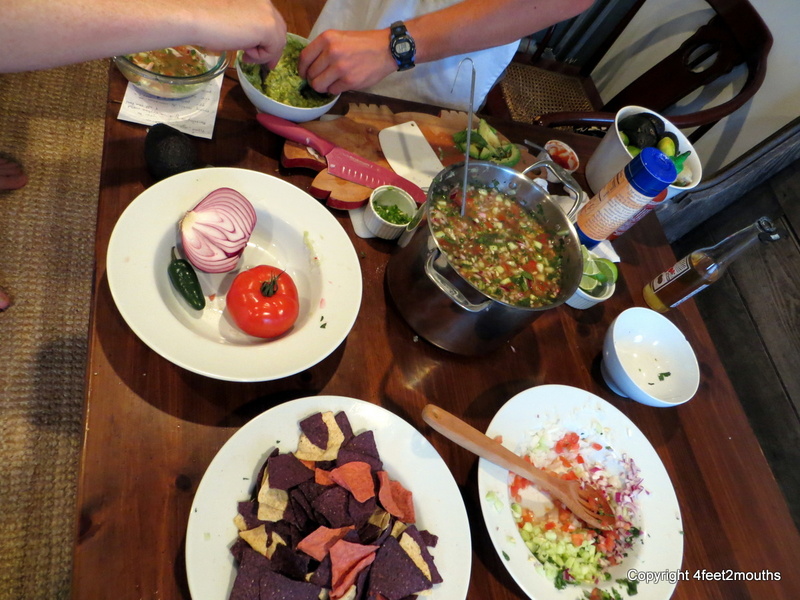 Chop up more onion, cucumber, tomato, cilantro and jalapeño and you can stretch it into a few more bowls. Notes on additional and substitutions: Oftentimes octopus is added, but I find that it adds a whole other texture that takes away from all the vegetables. Lemon has a whole different flavor, don’t use it. Other chefs use clam juice as a shortcut, this is not necessary because you will have an excellent broth from cooking the shrimp. Yum thanks for sharing this recipe. I’m always on the hunt for tried and true recipes! Jeff & I always enjoy your fabulous meals, cant’t wait to share this one with you upon your return! I’ll try it on my own prior to that, but as you both know I like someone else doing the cooking… I like the eating. Happy trails, keep in touch. As always thinking of you and sending you both love. Tried, true and tested a hundred times. Most of it is in my head. If you have any questions send them to me. This looks amazing. Going to have to give it a try! Wonderful! Let me know if you have any questions.